"Becky helped us evolve our organization, develop our operations strategy and make it actionable so we could turn it into real results. Becky has been a real asset to us and I really appreciate her." "I highly recommend Becky to help with any manufacturing-related issues. I hired her, and was amazed how she was able to come in to a manufacturing plant and quickly identify opportunities to improve efficiency and fix problems. Her insight was fantastic and her services were a great investment." "Becky was a tremendous help when I was working on an organizational redesign and work flows. Becky is a first class business professional and always focused on the business objectives of the customer." "Rebecca has a keen ability to think creatively and provide innovative solutions. Our conversations over the years have proven insightful and always caused me to think differently about how I view 'strategy' in the manufacturing realm. She is a voice whom I respect and turn to in order to keep a finger on the pulse of 'what's next.'" "Our journey has been very successful so far and I attribute a lot of that to the fact that we started right. If you're thinking about Lean, you should think about Becky." "We expect, as we continue to follow the principles that Becky has instilled in our organization, we will continue to see greater profits. I would recommend her to anyone." "Becky did an excellent job putting together a great strategic direction for our quality systems and I would recommend hiring her." "If you are truly ready to have an objective mirror held up against the state of your manufacturing operations, along with the deep commitment required to march on the path of continuous improvement, Becky is the resource you should use. She not only gets to the root of your issues, she remains engaged throughout the process to help resolve them." 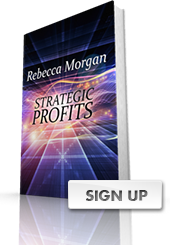 "Becky stands apart from the myriad business, productivity, lean, and operations consultants. Becky brings first-rate skills to every engagement. Her personal work experience in operations coupled with her passion for continuous learning & growth make her the equivalent of several different consultants." "We hired Becky to help us reduce inventory and improve quality and space utilization. She helped us convert to cells and left us with the knowledge of how to do that." "Becky was instrumental in giving us a roadmap to make our company a better company. She was a pleasure to work with." "Becky's skills and depth of knowledge have helped our company realize our goals. We have had and continue to have success as a result of the great advice and guidance that Becky has provided." "Becky has the multiple gifts of an experienced consultant, the training as an economist and manufacturing executive and the ability to interact as well on a shop floor as in a board room."